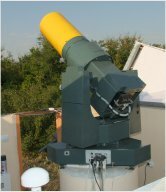 Astronomical photographic telescope (AFU-75) was obtained by the NAO under the contract with Uzhgorod Space Research National University. In 2009, the telescope was modernized. Project Manager – A. Shulga Responsible persons: V. Chernozub, E. Kozyrev, M. Haloley, V. Bessarab, E. Sibiryakova. The combined method of CCD observations is implemented on the telescope. It is the method of the object tracking on the electronic level and it has been developed at the NAO. As a result of the modernization of the telescope base liras (2) reduced in size, dismantled: polurama horizontal axis (5), the camera frame (6), drive equatorial platform (7), the telescope guide (8), the cassette part (9). 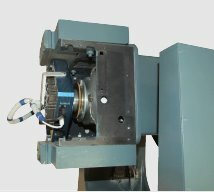 Worm pair horizontal axis is used in the manufacture of the drive axis azimuth and placed in the case of the equatorial platform (1). The horizontal axis is set at lager racks. New power-drive for axes-direction of angle of place and azimuth are installed. The telescope is equipped with a Saturn lens (D = 280mm, F = 750mm). The drives are equipped with Nanotec stepper motors and angle sensors ASC 6008. The spacial software was developed to control the telescope. Rotating platform and CCD camera Alta U9000, made by Apogee firm, are placed in the corpus of tape drive. The field of view of the telescope is of 2.8°x2.8°. The angular size of a pixel without binning is of 3.33". 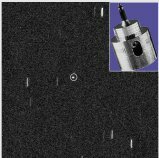 The speed of rotation of ​​CCD camera is of 6°/sec., setting error is of 0.1°. In 2010, the AFU-75 worked in the complex of Mobitel telescopes. 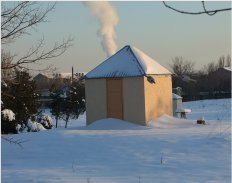 In 2011, the AFU-75 was installed in the pavilion of satellite camera. The dome of the telescope has electromechanical opening center. Electromechanical center includes a motor, gear and power transmission. The electronic control unit includes: 1. The control unit of dome opening, 2. The control unit of telescope drives, 3. Computer, 4. GPS-receiver. 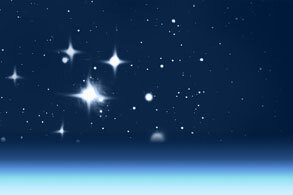 The observations on a program of space debris research are made using AFU-75. 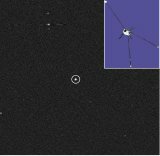 The Geosynchronous spacecraft METEOSAT 7, range 38 803 km, the apparent angular velocity is of 1.87"/s, exposure - 7.1 s. Observations of geosynchronous space objects held by the combined method, using rotating platform and mode CCD camera «time delay and integration». At the beginning of 2011, there were about 16,000 man-made objects, 75% of debris (boosters, dead satellites, as well as fragments) in earth orbit. Densely populated orbital debris can lead to collisions in space. The low-orbit spacecraft GGSE 1 (weight = 39kg, launched in 1965), the range is of 1291 km, the apparent angular velocity is of 0.31°/s, exposure - 1 s. Observations of low-orbit space objects is held to task space control and improve the accuracy of calculating of orbital elements.